What Is Smoking Food All About? It was about three of four years ago that my desire to learn more about smoking food really took off. Many years ago at the food fair I bought what's best described as a shoebox smoker, very primitive but it worked and ever since then I've been keen to discover more about the smoking process and how it all works. If you fancy trying your hand at smoking your own food let me explain the processes involved and how it all fits together. The origins of smoking were as a way of preserving food in the days before canning and refrigeration and there are three steps in the process. The first of the three steps really is now more about flavor than preserving and that's salting or curing. Flavors are now added to curing salts such as herbs and spices for additional seasoning and the salting process can take place as a dry cure or a wet cure (brine). One caveat to what I've written and that is that there are still areas of the world that rely on these preservation techniques eg Africa and poorer parts of Asia. Here preservation is of the utmost importance. The second part of the process is weight loss and this is done in an environment of controlled humidity. The weight loss is brought about through the evaporation of moisture from within the tissues and the logic follows that the greater the weight loss, the better the keeping qualities. Why dry something out in a humid environment, surely that's defeating the object? Well in part yes, but by drying out at a known humidity therefore takes the guesswork out of the process and dependent on the food that you are smoking (and its weight) you will be able to predict exactly how long the process is going to take. The third stage is the actual smoking and during the smoking process tarry deposits from the smoke settle on the food and these deposits are antiseptic in nature so they inhibit the growth of bacteria. The process can be further broken down into hot smoking and cold smoking. Cold smoking takes place at between 10 and 29°C and ensures that the food remains in a raw state at the end of the smoking process. It's essential that the tight tolerances of temperature are observed because if the temperature gets too high then the food will start to cook and this will change the texture of the food and it could start to disintegrate. This is more relevant in countries where the ambient temperature is quite high where it might not even be possible to get the temperature below 29°C. Food smoked and eaten raw is mainly confined to fish but can include beef. When hot smoking you are certainly trying to cook the food whilst imparting the smoked flavor and because of this the actual temperature is less important or to put it another way the range is larger. In the case of fish however there is a ceiling temperature of 93°C. Hot smoked fish is usually cold smoked first and then the temperature brought up to what is really a relatively low temperature for hot smoking. Mackerel done this way is absolutely magnificent. Once you have mastered the basics then it really is easy to smoke your own food. Probably the area that will require the most experimentation is the curing because it is quite easy to over-salt food and to be fair it is also a matter of taste. Paul Yates has written a buyers guide for meat smokers and gives away BBQ Aprons. 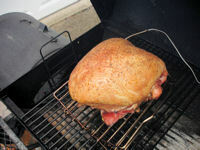 In addition he has published an e-book containing homemade smoker plans.